Basketball is a lifetime sport, one that can be played from a very young age all the way into adulthood. Learning the skills and game of basketball at a young age can benefit a child greatly, from learning to play with a team to developing the necessary hand-eye coordination that carries over to other parts of life. What’s the first step in giving the special child in your life the value of learning a sport like basketball? Having a quality hoop that meets that child’s needs is a great place to begin. Our pick for a favorite hoop for the younger ones here at Best Basketball Hoops is the Lifetime Youth Portable Basketball system. This Lifetime product is built to allow young ballers to have the ability to learn and play basketball with a hoop is their size and can grow with them. Let’s learn a little bit more about Lifetime’s Youth hoop. Lifetime has manufactured a product that can provide hours of fun to your children with lasting and durable materials. This hoop system comes with a 32 inch impact backboard, constructed with polyethylene for a high-density and strongly molded look. The rim is a reduced-size 15 inches, and features a frame made from solid steel; despite the reduced size of the rim, you can still play with a regulation basketball, making it a product that can grow with your child from the junior size balls to full size. Holding up the rim and backboard is a three-piece pole made of powder-coated steel, ready to take the blows of everything from shooting a game of HORSE to a friendly game with the neighborhood kids. Our reviewers have said that assembly of the Lifetime Youth Portable Basketball Hoop is no more difficult than other hoops, and is easy to both adjust the height and transport. As you research the purchase of a hoop for children, it’s important also to note the features that make the Lifetime Youth Portable Basketball System a good choice for your children, grandchildren, or students. First, is it going to last through the rough and tumble play of kids? Along with our above notes about the product fabrication, our reviewers also found the Lifetime system to hold up well. The base can be filled with sand or water, and provides a supportive foundation that can withstand hard play. The base also has wheels which allow the hoop to be moved to various locations in your driveway or garage. Since kids grow and change so quickly, it’s most important to have a basketball hoop that grows with them, and the Lifetime Youth system is a solid bet when it comes to a growing hoop. The hoop height is adjustable in 6 inch increments, and can grow from 5 ½ feet up to 7 ½ feet. 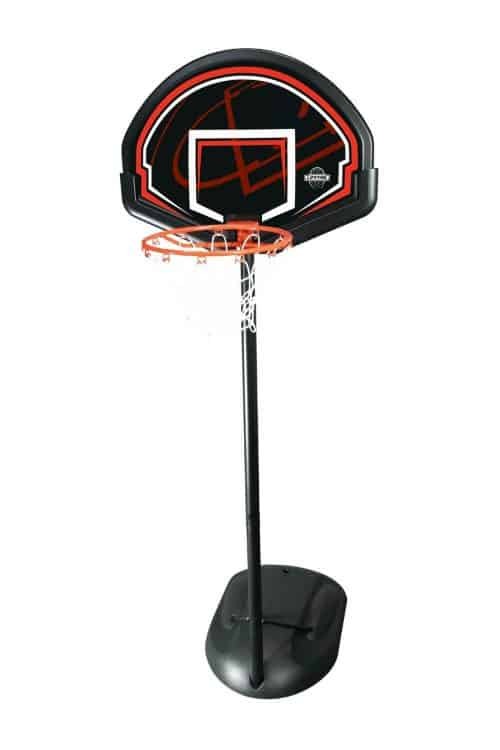 Our reviewers here at Best Basketball Hoops agreed that those heights make the hoop suitable for about 4 years old up to about 12 years old, or from about preschool to sixth grade, depending on the height of your child. Nevertheless, this Lifetime system can provide at least 5 years if not more as a great hoop for your home, and it can provide many years of use in a gym or school. It’s important for kids today to get out and play, to stay active and learn the value of teamwork, and to develop hand-eye and other coordination skills. Help your child learn and grow by purchasing the Lifetime Youth Portable Basketball System, so that they can build these skills, build relationships, and build a lifelong love for the sport of basketball.